Could Bigfoot really be out there? I feel you, Joe. Cryptozoology can be a cruel discipline, full of bitter old scientists with ruined reputations and plenty of Internet anger. Sixty-five-plus years of keeping hope alive—Bigfoot prints first hit the news in 1958—can take quite a toll on the psyche. This is not to say that the whole idea of an as-yet-undiscovered large mammal somewhere in North America is completely foolish. The Vu Quang ox of Vietnam and Laos wasn't identified until 1992; the first live specimen wasn't caught until '94. The blue-testicled lesula monkey (whose delicate visage evokes a Renaissance-era Jesus) remained unknown to science until 2007. GQ ran an article this fall about an elusive hermit who had been living without human contact in a Maine forest for 27 years, subsisting on stolen Twinkies. The list goes on. The cryptozoological consensus has it that Bigfoot is a primate, possibly some distant cousin to early man. Judging from the habits of other large primates (including humans), we'd expect Bigfoots to live on a mostly vegetarian diet of fruits, tubers, bark and leaves. They'd require 20 to 40 calories (and 100 milliliters of fresh water) per kilogram of body weight per day. Given an estimated body weight of 180 kg (around 400 pounds), we can guess Bigfoots must consume at least 3,600 calories a day. Keep in mind that's conservative: orangutans, who weigh only around 100 pounds, eat between 2,500 calories in lean times and almost 8,000, when food is plenty. Assuming food supplies permit, primate groups may keep to a small range of maybe a few hundred acres. But the bigger the species, generally speaking, the more foraging room they need per head—a western lowland gorilla can account for 350-plus acres of its own, and walk more than a kilometer a day in search of food. So unless the Bigfoots happened on some unusually well-stocked turf, they'd often be out and about hunting calories. 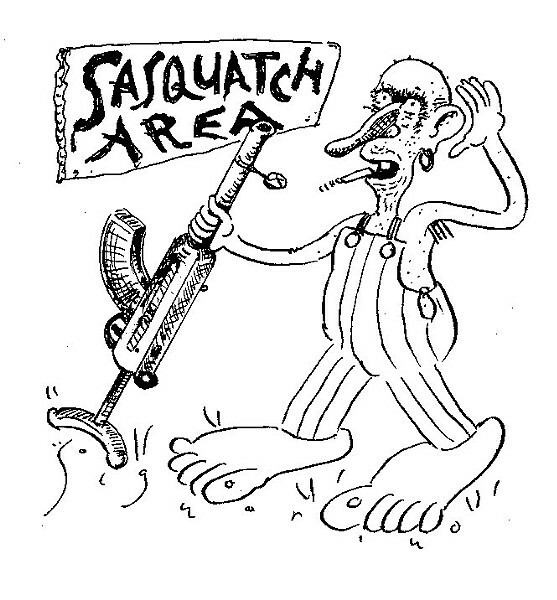 The number of Sasquatches necessary for a viable population depends on what your goals are. From a short-term genetic-diversity standpoint, there'd need to be something like 50 breeding Bigfoots—but even then you'd still have a lot of first-cousin reproduction going on. To maintain any decent chance of genetic viability long term would probably take at least 10 times that many. Where might this large theoretical community of Bigfeet reside? A 2009 study (designed to demonstrate some limits of software-based analysis) used a large collection of Bigfoot data—646 records of alleged auditory and visual encounters plus footprints—to run an ecological-niche computer model. The model concluded that Bigfoot should be present throughout the mountain ranges of western North America, but predicted that the effects of climate change would likely drive it further north and into higher elevations, away from the coastlines. Perhaps more important, though: plugging reports of black bear sightings in the Pacific Northwest into the same modeling software indicated that the bears should share exactly the same habitat. Since they also exhibit a similar size, poundage, and full-body coiffure, the well-honed deductive mind might therefore conclude that people are commonly mistaking black bears for celebrity sightings of Bigfoot. None of this has stopped Bigfoot believers, who every so often have actually managed to get Sasquatch-preservation ordinances on the books in parts of Washington State. But let's keep the obvious in mind here: In all recorded history there has never been found a single confirmed Bigfoot fossil, bone, hair or flesh sample. DNA testing on alleged remains of Sasquatches and yetis has proven them to have come from cows, porcupines, or occasionally the extremely odd-looking serow, but nothing previously undiscovered. As for the bear-carcass argument: Yes, bear carcasses are rare finds, but plenty of well-documented examples have turned up, as well as enough fossils to support a theory of their evolution and reconstruct their migratory patterns. Could there be one lonely Sasquatch wandering around, the last of its species, just living out the days until its uncelebrated demise? Possibly. But if the final Bigfoot falls in a forest and no one is there to see it, will all those bitter cryptozoologists be vindicated? It's doubtful.